A Holiday Collection that changes the "Grand" to the "Glam Finale".. Break out your sequins and rock the night away this Holiday Season with these party-perfect glitters and merry metallics. "Don't Be A Snow-Flake" - You're bound to be looking like a glamorous snow-flake in this glistening silver. Long-wear nail lacquers that are chip free & flexible. Durable, fast drying and easy to apply. Professional brush for easy application. 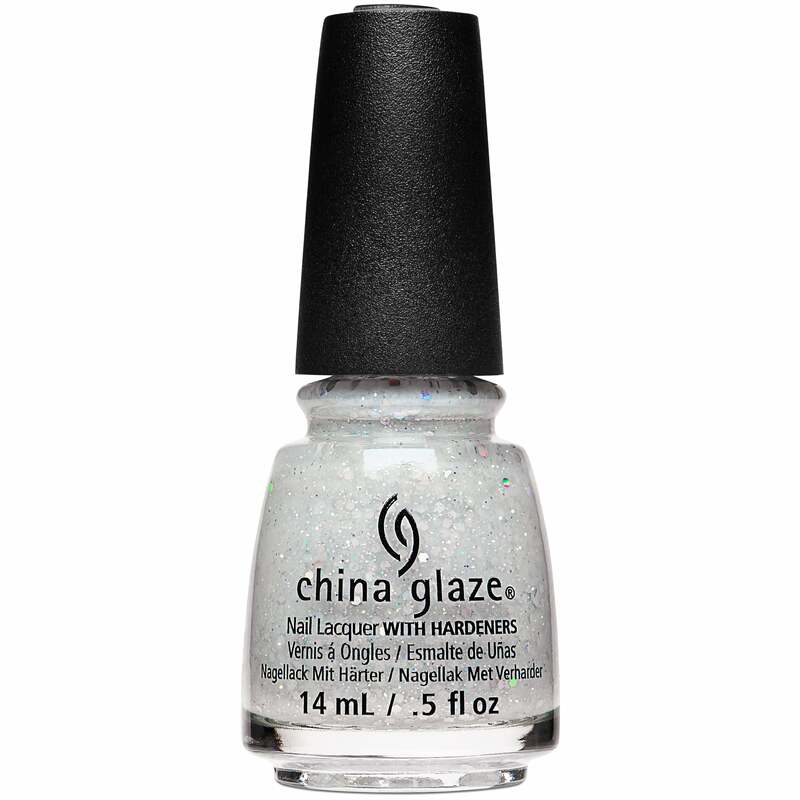 Apply one coat of China Glaze "Strong Adhesion Base Coat". Once dried apply "Don't Be A Snow-Flake". Apply 1-2 coats depending on your desired opacity. Once dried apply one coat of "China Glaze No Chip Top Coat". Inviting you to Live in Colour..
China Glaze has been raising the bar in the Nail Care Industry since 1998. They have upheld and smashed every expectation one collection and colour at a time. China Glaze now have a huge global cult-like following full of colour lovers. They have lived for colour and have since created more innovations in colour technology in Gelaze; a Gel-based formula which colour matches China Glaze shades. Then they created EverGlaze which is a long-wear technology, with active technology. So overall China Glaze are a colourful company that exceeds every expectation and makes us want to Live In Colour. Unleash your inner colour with China Glaze’s full range of light to dark nail lacquers. Cultivated on the belief that uninhibited self-expression is a vital part of life, each China Glaze shade is developed with a unique spirit and individual personality, representative of personal beauty & style. Ranging from classic neutrals to exceptionally bold neons, the China Glaze colour palette knows no limits. China Glaze has an exclusive range of nail polishes and treatments available in a variety of striking colours & finishes, with over 300 colours to choose from - including top selling treatments. China Glaze continues to be a favourite within the nail and beauty industry, releasing some of the most popular nail polish collections throughout the year. With a line of professional nail products, you can be sure to find the collection, shade or nail accessories you are looking for. Showing our 2 China Glaze The Glam Finale 2017 Nail Polish Collection - Don't Be A Snow-Flake (84101) 14ml reviews with an average rating of Excellent. Would you like to write a review? Great colour but hard to remove due to the big chunks of glitter. Looks great on a white base, with a plumping top coat, very festive.